It should be illegal to drive past St. Andrews, NB (or St. Andrews-by-the-Sea as it is often called) and not stop. This historic gem has so much to offer that it is no surprise the area has been recognized internationally as a #1 destination. Regardless of your age or interests, St. Andrews has something for you. The seaside village began in 1783 when a group of British loyalists in Castine, Maine realized that they now lived in the United States. When the Revolutionary War ended, and the borders were drawn, the town was 100 miles behind enemy lines! The villager’s response was to load their houses on barges and head for Canada, founding St. Andrews as a British town just across the Canadian line. The community they built is now a National Historic District, and one of the oldest and loveliest on the east coast. St. Andrews began as a sea port but was transformed in the 1890s into a summer resort for the very wealthy wanting to escape the heat, humidity and disease in big cities. Trains came from Boston and Montreal, bringing vacationers along with maids, butlers and other servants. Over the decades since the “gilded age,” St. Andrews-by-the-Sea has become a playground for everyone, young and old, budget conscious or flamboyant. 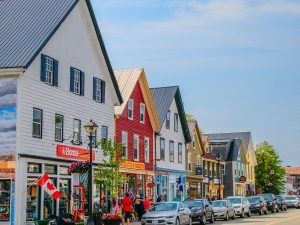 The coastal town and the surrounding area are so full of treasures that it was hard to create a list of only 10 reasons to make it your destination. Come and visit — and add your own special reasons. History. If you are a history buff, or have just a little interest, St. Andrews has lots to offer. Don’t miss the Court House and Goal, Sherriff Andrew’s House, The Ross Memorial Museum, the Anglican Church, and the Overlook at St. Croix Island. Whale watching. There are a number of whale watching companies located near the pier in St. Andrews. 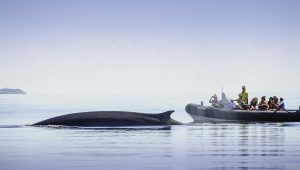 You can view the Bay of Fundy’s beautiful whales from a Catamaran, a tall ship, or a fast Zodiac, dressed in special waterproof gear. Kingsbrae Garden. Ranked as one of the best public gardens, this 27 acre park is not just for “green thumbs.” In addition to 50,000 perennials, there are dozens of sculptures and works of art, alpacas, peacocks, interactive classes, and an award winning café. Shopping. The main street is lined with shops and galleries that have something for everyone. Even if you hate shopping, you will have fun! Adventures. Kayaking around islands, hiking on the numerous trails, lying on the beach at Katy’s Cove, New Brunswick is the great outdoors. Aquarium. The Huntsman Fundy Discovery Aquarium lets you explore the rich ocean around St. Andrews-by-the-sea which has the highest tides in the world. Along with the Wild Salmon Nature Centre there is much to learn, fish and seals to watch, and interactive opportunities for the kids. Food. If you have a weakness for lobster, clams, oysters, salmon — and everything else that comes from the sea — St. Andrews has a restaurant for you (that probably has a great view of the bay). Don’t despair if you are not into seafood. There are Irish pubs, pizza parlours, vegetarian meals and so much more. Homes. If you like architecture the drive around St. Andrews will fascinate you. The Greek revival court House, the mansions and “cottages,” the towering Algonquin Hotel, and the original town square are extraordinary. The intersection of Montague and King is thought to be the finest in Canada. Kids. It should be impossible for kids to get bored in St. Andrews. In addition to all of the places to visit there are parks and open areas. The St. Andrews Creative Playground provides hours of fun. Make sure you plan to spend enough time in St. Andrews and the surrounding area to really explore and enjoy. The constant complaint of visitors is that they did not allocate enough time for a good visit! Hope to see you soon.